May 25th Coolsculpting event is full. Join us for our next Coolsculpting event June 16th. We can help you get ready for summer with results that will last through the season and beyond with CoolSculpting. The non-invasive Coolsculpting procedure will have you ready to hit the beach, bikini ready for summer. 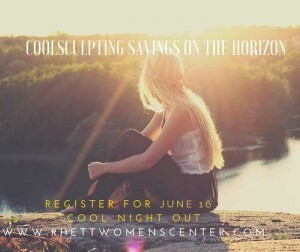 Register for our “Coolsculpting Cool Night Out” to get bathing suit ready. Enjoy attendee only savings and a raffle of a free area. Space is limited. Coolsculpting event Thursday, June 16th from 5:30-7:00pm at the Rhett Women’s Center Mt. Pleasant Office. To register call 843.375.2210 or register online here. Sometimes an active lifestyle and a healthy diet is not enough to get rid of stubborn fat in problem areas like the stomach, lower back, thighs, and “double chin.” Coolsculpting eliminates stubborn fat safely and effectively, without surgery or downtime. Results are proven, noticeable, and lasting. Now offering Cool Mini for the “double chin” and Dual Coolsculpting so you can eliminate twice the fat in half the time. *Note: Results may vary by patient.